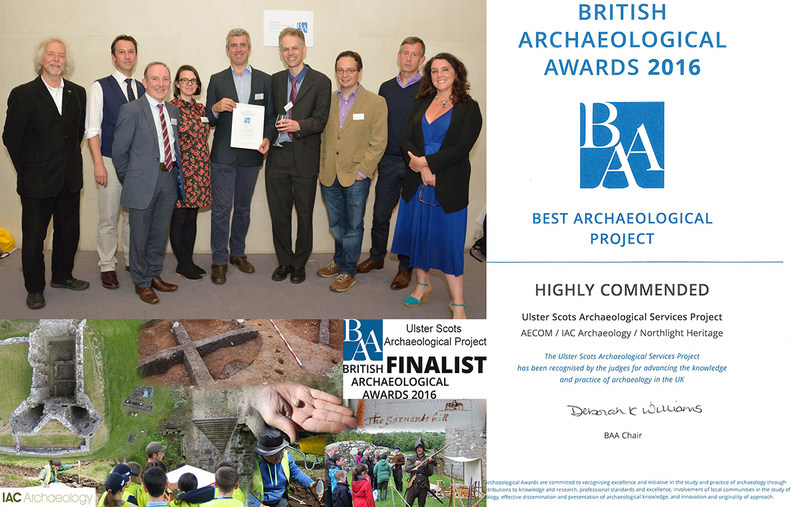 The collaborative Ulster Scots Archaeological Project, joint venture between AECOM, IAC Archaeology and Northlight Heritage, was a finalist in the British Archaeological Awards 2016. It was shortlisted for the ‘Best Archaeological Project’ alongside ‘Westgate Oxford’ and ‘Silchester Town Life Project’. At the award ceremony on 11 July in the British Museum our project received a ‘Highly Commended’ accolade with the award going to the Westgate project. The project, commissioned by the Department of Culture, Arts and Leisure, comprised of three seasons of research excavations with a strong community and school involvement, and a survey of all the known Plantation sites in Northern Ireland culminating in the production of a landmark publication on the archaeology of the Ulster Scots. We also undertook a series of community workshops in North Belfast and Carrickfergus and produced an education pack for Schools (Key Stages 2 & 3) and a General Reader booklet. We are very proud of our project and the achievement of all the team and would like to take this opportunity to thank everyone involved throughout the duration of the project including, but not limited to, Neil MacNab (AECOM), Christina O’Regan (IAC), Fintan Walsh (IAC), Rowan McLaughlin (IAC), Nick Brannon, Andy Copp (AECOM), Heather James (Northlight Heritage), James Lyttleton, Paul Logue (Dept. Communities), Gerry Kelly (DCAL), Tony Corey (Dept. Communities), Gavin Donaghy (IAC), David McIlreavy (IAC), Paul Duffy (IAC), Dave Swift (Claoimh), all field staff, our community volunteers and everyone who visited the excavations and attended open days. A compilation video prepared for the British Archaeological Awards is available to view on their website.